Comfortable apartment set walking distance from Zattere and Campo Santa Margherita, near transports that will allow you to reach the other parts of the city, near shops and restaurants. Independent heating, AC, washing machine, dishwasher, TV, internet, no elevator. LOCATION: This modern & spacious apartment is located one bridge and two passes from the beautiful Zattere and Campo Santa Margherita. Here you will find the locals soaking up the sun, sipping a spritz, enjoying the many outdoor restaurants and café’s. LAYOUT: 2BEDRM;1 FULL BATH- Sleeps 2-4; Consists of Master bedroom with queen size mattres, bathroom, guest bedroom with one sofa bed for 2 Sleeps. The kitchen is bright and open, you can dine comfortably in 4. The heating and air-conditioning can be regulated to your preference. The amenities include: Dishwasher, Washing Machine, Oven + Cook top, Toaster, Television, Iron & Ironing board, Towels & Linens. Marcello (and his assistant, Valentina) were extremely helpful with advice about how to enjoy our stay in Venice. The apartment is comfortable, and the Dosoduro area is enjoyble to walk around--with several very good restaurants 10-15 miutes away. The nearby supermarket is a great convenience, as is the No.1 Vaporetto at Ca Rezonico--a "straight shot" walk of about 15 minutes. We would happily stay there again. Nous voulions nous sentir 'chez nous' pendant notre semaine à Venise. Ce petit appartement chaleureux et joliment meublé, situé dans un quartier authentique et central, nous a permis de réaliser notre rêve. Calme et refait à neuf avec goût, il est idéal pour séjourner à Venise. Les lits sont très confortables et la vue sur le jardin magnifique. Merci à Marcello pour son accueil et sa disponibilité pour résoudre nos petits tracas de voyageurs. La gentillesse des vénitiens nous a beaucoup touchés. Nous reviendrons dès que nous pourrons. The ONLY reason I hesitate to sing the highest praises about Marcello's building is because I fear that it will become too popular and I won't be able to rent it more conveniently and when I want it. It's purely selfish, you see... I was incredibly thankful to find this apartment. I was having an emergency situation in Venice while staying elsewhere and contacted the owner on very short notice. Marcello was very kind and the rental arrangement was made. A smooth transaction. He is quick to respond to any questions and a gracious host. He lives in the same building in another apartment but is not intrusive during your stay by any means. The apartment is very clean and modern. The furnishings are a mix of familiar, gently used family furniture and more modern pieces, but all pieces are comfortable. I felt instantly at home there. It is spacious, with lots of sunlight from the large windows, so the apartment felt like an artist's studio, even in winter. The apartment is very clean on arrival and is easy to keep clean. The mattress on the bed was not too hard and not too soft, but just right. I almost hated getting out of it every morning. Lots of closet space as well. The kitchen is practically new and I enjoyed making the majority of my meals during my 12 day stay here. It is very well supplied in the way of pots, pans and dishwares and plenty of cupboard space for groceries you may bring in. Stovetop, oven, microwave, washing machine, heating and air-conditioning. Everything a person needs in a comfortable setting is right there. The bathroom has adequate space for one's personal items, and there is a hair dryer supplied. The shower has good water pressure too. I love the neighborhood. It is near the Terminal building at San Basilio, so catching the #2 vaporetto is simple - one minute away. Arriving in Venice, this location is simple to find if you are walking from the Piazzale Roma bus terminal or from the train, they are a quick walk away, approximately 14 to 17 minutes. If you wish to arrive from the Grand Canal on the #1, it's only a five minute walk with only one bridge. The area can't be beat, and the apartment is perfectly suited for a short or a long stay. (Just make sure you leave the apartment available for me when I want to use it, okay?) But in all seriousness, please enjoy your stay. Best of luck to you, Marcello, and your family - you are wonderful and kind people! The apartment is perfectly situated — just two steps from our favorite bars on Campo Santa Margherita and the best cicchetteria Al Bottegon. Yet - it's very very quiet. On the mornings you hear only birds singing and the church chimes. The house itself is practically in the very end (or beginning) of Zattere. The ferry stops only 1 small bridge and few steps from the apartment and it's great for those who travel with a big suitcase - it's easy to get there from the railway station (just take the vaporetto and in 10 minutes you are here). Small Billa supermarket is also just at your hand (on Zattere) - there you can find everything you need except fresh fish. Small market with seafood and fruits you can find at Santa Margherita. For wider choice - go to the Rialto market. As for the apartment - it's just great. Big kitchen with a dining table, nice sitting room and a bedroom with a bath on the second floor — everything is made with a good taste and soul. There is also another bedroom with two separate beds downstairs but I think that the apartment is ideal for a couple. Many thanks to MARCELLO! He is a great and easy-going host. A presto! Séjour enchanteur ! L'appartement correspond parfaitement à nos attentes : très bien placé dans la ville, bien desservi par les vaporetti (sur le canal de la Giudecca ou sur le Grand Canal), au coeur d'un quartier vivant, commerçant. Appartement très bien tenu, calme, plein de charme ! Accueil chaleureux et prévenant de la part de son propriétaire, qui conseille par ailleurs de très bonnes adresses ! We spent a week at the Harmony San Basilio in Venice and can offer our highest recommendation. The apartment is newly renovated, wonderfully furnished and extremely comfortable. It was immaculately clean and was very comfortable for the two of us. The neighborhood is perfect. Out of the way of the main tourist hordes, but very convenient – a few steps from the vaporetto and grocery stores, close to wonderful squares (campos) and restaurants. The neighborhood was very Italian rather than touristy, and was clean, well lit and felt very safe. Marcello has several apartments in the building and we are confident they are all terrific. Marcello was great to work with – emails were answered promptly and enthusiastically and he provided great advice for local restaurants. He accepts deposits by PayPal, which for Americans at least, is a great advantage, as it saves the high bank transfer fees. Next time in Venice we’ll stay with him for sure. We had a wonderful time. The location, near the Zattere, is perfect. Marcello was gracious and helpful with many suggestions that helped make the most of our stay. The apartment is well equipped, quiet and comfortable. All parts of Venice are a scenic walk away. We will definitely stay here again. Joli petit appartement propre et au calme. Equipement très complet et fonctionnel. Le propriétaire est très sympa. Pour arriver facilement à destination prenez le vaporetto ligne 2arrêt San Basilio. Au débarcadère prenez tout droit et sur la place prenez le pont sur votre gauche, vous êtes arrivés...Je recommande cet appartement, il est top ! A magnificent restored apartment two steps from the beautiful Zattere and Campo Santa Margherita. 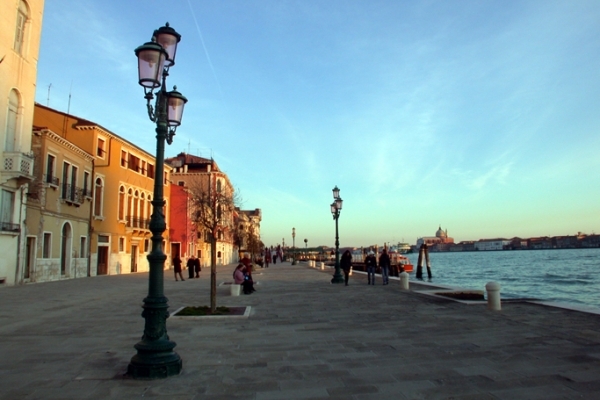 Wonderful location - Dorsoduro is a lively neighborhood but peaceful. Yet easily within walking distance to San Marco. All amenities in the apartement. Extremely helpful and nice owner. Our stay at Mr Marcello flat was a great one from the time of booking to even during the week. Before we arrived, he gave us some practicals informations, very useful. A list of his favorite restaurants - nothing like having information about a place from local people. Be "CALLE" walk to discover Venice, do not miss early evening, the BACARI o BACARO (wine tapas bar) the delicious "cicchetti". To enjoy, you'll be standing at the counter and sometimes in the street, not always easy to access. The atmosphere is great in a warm buzz. CANTINE DEL VINO-SCHIAVI - SAN TROVASO - DORSODURO But, above all, Marcello was a top-class host to us. We strongly recommend this flat for your next visit to VENICE. Recommended for: Sightseeing, tourists without a car, girls getaway, adventure seekers, romantic getaway, age 55+, families with teenagers. To Marcello from a Danish Family living in France. This is an excellent apartment for two couples. It is very well positioned just a short walk from San Basilio vaporetto stop. It is only 10 minutes walk from bus or train station. The apartment is close to the lively San Margarita square and the Zattere but is very peaceful(the large gardens at the back provide birdsong on the morning) There are many good restaurants and a Billa supermarket close by. The apartment is compact and well-planned with good furniture and a well-equipped kitchen.It is a pleasure to return after a days sightseeing. On arrival you will be impressed by the cleanliness. Marcello, the host,is helpful and available if needed.He has provided a very useful manual for the flat and the area. We thoroughly enjoyed our stay and hope to return. We felt at home. Comfortable and immaculately clean. Charming, quiet neighborhood. Very good supermarket around the corner. Many restaurants. We toured in the morning, ate lunch around town, walked and spent a lot of time on the front deck of Vaporetti. Get a weekly pass or one for the amount of days you will be there. We certainly got our moneys worth. The Vaporetto stop is very close. We cannot wait to return. Venice is fabulous. So much beauty!